And no one is trying to stop it. The symphony of destruction echoes out. The rain that falls sounds almost like the tone of tears. I can hear this song coming to me. And so the flame of hope starts to go out. Your eyes are for acknowledging each other. Your voice is to convey your feelings. Your hand is to hold with the one who is precious to you. That will never be scathed. The things you truly loved? Cry without an end for your sins. No matter if the things you have lost are countless. Holding the strength to live on. Sometimes you’ll meet people with whom you’d spend almost every waking hour with. You’ll feel so connected with them that it’s going to be immensely difficult to imagine a life without them. They become a habit… becoming a point where everything else in your life seemed to be revolving around. You are a compass always pointing at their direction. They define what’s normal in your life. You see something interesting and you immediately turn to your side to tell them about it, expecting them to always be there. You have a story in your mind and they are the first person you want to tell it to. You just parted to go home and you can’t wait until morning to see them again. At that point, you don’t realize that even such wonderful things can be temporary. Yet this life offers a multitude of unpredictable experiences and paths, that even if you try your hardest to hold on, life still goes on. It won’t stop. The trajectory of your life is your own. It doesn’t depend on others. So you realize that happiness doesn’t last forever. Things change. People change. Goals in life change. Nothing stays the same. Same thing must happen with the perfect haven you have formed. No matter how much you struggle against it… change eventually does happen. And one day, your time together will be over. You will begin to place more importance on different things, focus on different aspects of your life, and make different choices. Little by little, you won’t notice it coming, but you’re drifting apart. Then one day, you’ll realize that you have nothing to talk about because you have nothing in common. Your conversations become intentional, and you become careful in your choice of words. It’s not spontaneous anymore. You will remember the time when ‘fun’ was about spilling your mind to this person, just saying everything and anything. Now, you have to look for something to talk about. There will be an awkward silence, followed by nervous eye-shifting finger-twiddling gestures which indicate your attempt to excuse yourself from this torture. That’s when it’ll hit you. Your time has passed. It’s time to move on. It’ll be hard because the time you spent with them made you feel complete, like you don’t need anything else and you knew the true meaning of happiness. You want it to be the same. But this person standing next to you has changed, and so have you. If your lives were a line, you’d figure out that yours and theirs are going the opposite direction, and the time when you felt one with them represents a tiny dot marking the X intersect. If you can have just one wish, you’d ask the genie or whoever the gift-giver was to return you to that time and place you remember so vividly in your memory… the time that seemed to have merged the past, present, and future in one special moment… where the surroundings blurred and the world can fall into darkness, but that’s perfectly fine because the only thing that mattered anyway was already within your special sphere… you wish to return to that time just to feel it one more time. But you also know that there is no going back. You have to accept change and look forward to the positive things that come with it. You have to welcome change because there exists out there, someone whose line runs parallel to yours, and will never part. Discrimination. Racism. Sexism. Apartheid. War. Genocide. The list goes on. The world is clearly on the path to ruin. People of the world love destruction. Why would people want destruction? In a time where progress and technology are making leaps… everything is easier than ever before, access to information, to medicine, communication… but it’s also becoming harder to find any meaning in living… so I guess conflict is IN because it’s exciting. It’s news. It’s entertainment! No. Wait. I take that back. We’ve been down this road forever. Brutality and violence isn’t something new, it’s a repetition of history. It’s humanity’s ‘thing’. Mankind is racing fast towards their own demise, and nothing we can do will completely stop it. We can only hope to slow it down by taking preventive measures and improving futilely the laws of the world…. and we must do it in a world where anarchy presides as the only governing system. So why do anything at all? Is there any sense in doing something at all? No matter what we do, it’s leads to mistake after another mistake. We keep trying to stop history from repeating itself. But a repetition of the past is where we always end up. No matter where we look, it’s the same issues, the same problems, it’s all the same since the beginning of civilization. Perhaps the problem is with civilization itself. I’m tired of feeling helpless… unable to help the weak, the minorities, and the underdog of society. But what’s the use? Even justice is futile. Right after gaining some influence, these very same underdogs will jump at the first chance to trample on others as well… because that is the only way to stay in power. Society NEEDS an enemy. The privileged needs a counterbalance, someone or something to exclude so that their own people can keep working together out of fear of the ‘other’. Achieving equality have never been and will never be a conclusion, just another transition to the next version of the same persistent inequality. People who experienced suffering and are helped, cause pain to others. Then when the new disenfranchised group rises, they too exclude another group. History is just a cycle. Free will? Liberty? Rights? There are no such things. We are all victims. And at the first opportunity we get, we become the perpetrators. We become the tools of history so it can demonstrate the inevitability of events. So it can show us how perfectly incapable and naive we are at governing ourselves and doing the right thing. History and even contemporary events teaches us this painful lesson… again. and again. and again. What can we do to break the cycle? How do we paint the future? Maybe this is why people don’t care for each other. Maybe they know inside that it’s all a farce… that pursuing individual benefit will always outweigh any rewards borne from efforts to achieve a just society. Maybe that’s why it’s in our nature to “just live in the present”, never learning from history, and never preparing for the future of the generations after us. That’s why it’s hurling itself towards ruination. So why should I fight for the preservation of a specie that does not even want to survive? Why should anyone defend it? I’m sick of this. Maybe it’s time to give humanity what it really wants. What it needs… In order to change. I think only a drastic and completely overturning event will convince people to open their minds and eyes to the truth. Otherwise, when will people see the intrinsic value in justice? When will we live together equally, really and completely together without prejudice and hate towards people who are different? When will we learn to love one another? Maybe a global cataclysmic humanitarian catastrophe is really warranted. Perhaps it’s even long overdue. My life’s wish is to see it all happen… to experience the earth-shattering and astronomical events… feel the fear of society in my veins… then through all that still see hope emerging in people’s eyes… and be present as mankind rebuilds everything from scratch. Watching videos online is probably one of mankind’s most used method of entertainment (and procrastination) these days. By simple observation, it’s easy to determine what people like and don’ like, depending on the number of views. It surprises me that the most watched are either the most horrible videos… as well as the kindest and most heartwarming. Polarized much? So, it tells me that people are desperate for humanity. They want to see acts of kindness and generosity. But there’s also a lot of people who like bad things and participate in the propagation of malice and immorality. Is the population of the world polarized between good people and bad ones? People who watch offensive videos and make hateful comments are the more often same ones whose hearts are melt by genuinely humanitarian videos, the same ones who appreciate and congratulate the doers of a kind selfless act. Maybe the fact that ‘bad’ and ‘good’ videos are the ones most watched in the net proves the duality and complexity of man. People don’t like ‘moderate’, unfeeling videos. they want the extremes, based on what their situations and moods are at the moment. Does this mean man is intrinsically good, and is just spiraled into the bad because of the world’s influence? Or is it that man is inherently bad, and it’s just his/her choices that sometimes makes the good triumph despite the darkness inside? Is it the world’s fault or must man constantly fight against their urges? All I know is that mankind themselves fill the world too much inhumanity as if they are hell bent on destroying everything in its path, but they all want hold to on the the little bit of kindness left. They keep looking for that elusive hope to bask in the lightness surrounded by darkness. Now, is this dichotomy what it means to be human? Perhaps. I don’t know. What would have caused the [ancient civilization of Laputa] to abandon their advanced technology to live modestly on earth? 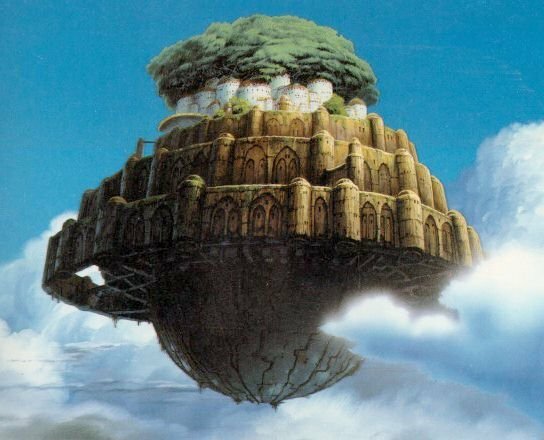 In Ghibli’s Castle in the Sky, the character Shita boldly faced the villain who wanted to use the technology left by the Laputans for his own agenda. When confronted with this question, she answered that it was because they [Laputans] realized that without love, all the technology and comforts of life was useless. They needed to go back to earth to start anew… because that’s where they came from, and that’s where everything goes back to. I admit I never fully understood her answer when I first heard it. Why do you need to give up everything, when you can just repair what’s broken, right? Humanity certainly did not need to go back to the middle ages to experience love. They just needed to change the structure and the system. They CAN change and love again even while holding on to lavishness, comfort, and technology. Then, one day I decided randomly to watch Wall-E. In the end, the humans who spent generations in space and have evolved into useless fat consumers, fought for the control of their ship in order to go back to Earth. They left the ship’s security and started planting to revive the land, even though they had to give up all their fully-automated robot-managed easy lifestyle. As the credits rolled, it showed pictures of how civilization evolved once again. New buildings were built, some were reconstruction of abandoned ones, people started fishing and trading and traveling the old fashioned way… all the while the ship Axiom accumulated undergrowth with time, all the former glory and wonders of technology vanished. It’s tragic somehow. Yet, it’s also rejuvenating in that it was a time for new beginnings. It’s like staring at the last line of a book and deciding to finally close it and put it in a shelf. This was an opportunity for humanity to live and experience life once again! Imagine all the adventures, the mysteries, the knowledge that people will get to uncover and experience. Imagine a new history! Clearly, the gains of abandoning advancement to pave way for a new story is definitely worth it. It just struck me how, after generations of abandonment, people would probably start forgetting the consequences of living in such mindless luxury. They would dig the remains of ancient technology and learn through it. Instead of looking into the future, as we do in this generation, people would look in the past to search for answers. The problem begin s when humans become greedy again. I mean, it’s bound to happen. With the first generation personally experiencing the events, the information will readily available and could be passed down to, say, a couple more generations. But what about the fourth, fifth… what happens when the legacy of the first settlers fade and become corrupted with time? When humans forget their responsibility to earth once again, and begin looking for personal benefits at the expense of others in every turn. When discontent, selfishness, desire for dominance settles into their hearts… what would happen then? I tell you what, history is going to repeat itself… and that’s the real tragedy.